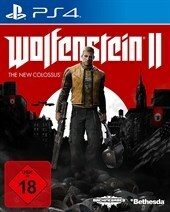 In Wolfenstein 2: The New Colossus könnt ihr 71 Trophäen (Trophies) freischalten. Die folgende Liste zeigt euch alle Trophäen und die Bedingungen zum Freischalten auf einen Blick. Find at least one of each collectible item. Find all of Max's toys. Collect all Übercommander death cards. Beat the game on "Bring 'em on!" difficulty or higher. Beat the game on "Do or die!" difficulty or higher. Beat the game on "Call me Terror-Billy!" difficulty or higher. Beat the game on "I am death incarnate!" difficulty or higher. Beat the game on "Mein leben" difficulty. Ramshackles tackle a charging Supersoldat. Perform a Constrictor Harness takedown. Perform a Battle Walker takedown. Stealth kill 10 enemies in a row. Acquire all Contraptions and Contraption upgrades. Achieve the highest score in the Shooting Range. Achieve the second best time in the Killhouse. Perform a takedown while in the wheelchair. Throw a hatchet and kill an enemy from 30m. Decipher an Übercommander's location using the Enigma Machine. Finish a District without triggering an alarm. Stop the Nazi signal from Section F.
Kill Hitler during the Aerostat Audition. Beat the Panzerhund ride without killing anyone on "Bring 'em On!" difficulty or higher. Destroy a Zerstörer with an Übergewehr. Wait for the game to resume after the credits. Escaped from Research Station Omega. Enact Revenge on Übercommander Metze. Find all readables in "The Adventures of Gunslinger Joe". Find all gold in "The Adventures of Gunslinger Joe". Beat the "The Adventures of Gunslinger Joe" on "I am Death Incarnate" difficulty or higher. Beat "The Adventures of Gunslinger Joe" on "Mein leben" difficulty. Beat the Station Omega challenge on "I am Death Incarnate" difficulty. Beat the Nightmare challenge on "I am Death Incarnate" difficulty. Beat the Venus challenge on "I am Death Incarnate" difficulty. Find all readables in “The Diaries of Agent Silent Death”. Find all gold in “The Diaries of Agent Silent Death”. Beat “The Diaries of Agent Silent Death” on "I am Death Incarnate” difficulty or higher. Beat “The Diaries of Agent Silent Death” on "Mein leben” difficulty. Beat the Sacramento challenge on “I am Death Incarnate” difficulty. Beat the Hollywood challenge on “I am Death Incarnate” difficulty. Beat The Moon challenge on “I am Death Incarnate” difficulty.